Where is the final policy report? You can read the final policy report in full here. This FAQ page applies to all Seattle main-campus classes. The policy implementation for sections occurring in the Health Sciences (the Health Sciences Building, UW Medical Center, Foege Hall, and South Campus Center) will be different. For more information, contact Health Sciences Classroom Services at hsbrooms@uw.edu, 206-543-6729. What are the key points of the policy? The standard instructional day is now defined as extending from 8:30am to 6:20pm. Classes will have to be more evenly distributed across the instructional day. For the first two years of implementation, scheduling units will be allowed up to 12% of their classes to meet at any given time per week. After the first two years, if more distribution is needed, scheduling units will have to reduce their offerings to no more than 10% at any given time per week. Class meeting times will now have pre-set days/times for meetings prior to 2:30pm (aka, ‘block scheduling’). Large classes (250-sized and above) will be scheduled annually (starting with WIN/2019). Gateway or required courses will be given priority in the scheduling process. When will the policy be implemented? The first quarter that the policy will be enforced is Spring 2018. The policy will not apply to Summer quarter schedules. What reporting tools will be made available to help with the implementation? 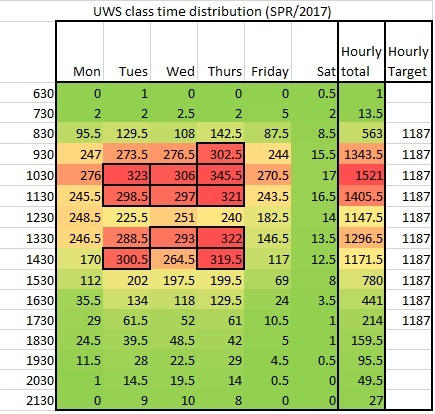 The Office of the University Registrar (OUR) is partnering with UWIT to create a report that will allow a ‘heat map’ visualization similar to the one below to help scheduling units determine where they are in and out of compliance with the distribution policy. While UWIT develops the heat map visualizations, you can download an Excel spreadsheet that you can modify and will update a heat map immediately. These interactive heat maps can be found here (UWNetID login required). 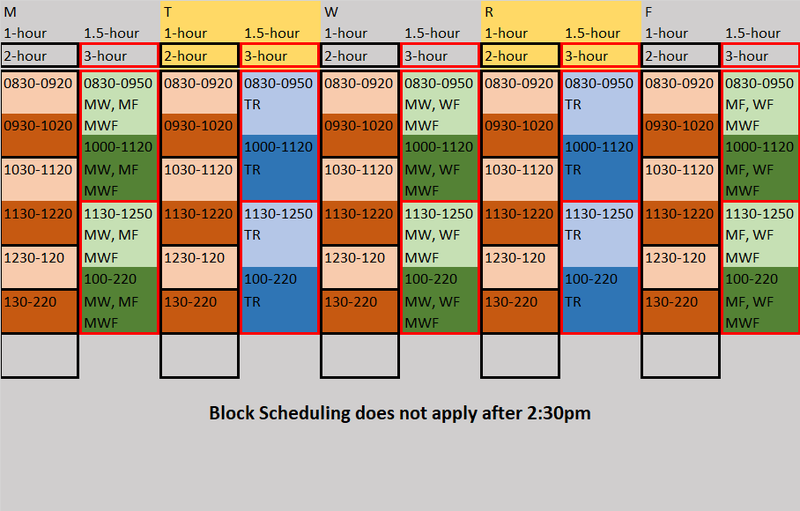 Also, Time Schedule Construction will be updated to accommodate the new scheduling blocks. What are the scheduling time blocks? Blocks for 50-minute meetings (“hour-long classes”) must have starting times of 8:30, 9:30, 10:30, 11:30, 12:30 or 1:30, and meet at the same starting time throughout the week. Blocks for 80-minute meetings (“90-minute classes”) have starting times of 8:30, 10:00, 11:30, 1:00, and meet at the same starting time throughout the week. Blocks for 110-minute meetings (“two-hour classes”) have starting times of 8:30, 10:30, 12:30, or 1:30, and meet at the same starting time throughout the week. Blocks for 170-minute meetings (“three-hour classes”) have starting times of 8:30 and 11:30, and meet at the same starting time throughout the week.. Classes that meet three times per week at the same time and for the same duration must meet on Monday, Wednesday, and Friday. Classes that meet twice per week in large-capacity (250+) classrooms meet only on TuTh. Classes that meet twice per week in other classrooms have more flexible options (MW, MF, WF, or TuTh). Classes that meet four times per week can request any four days of the week. Classes that meet once per week can meet in any of the scheduling blocks. What if we do not follow the time blocks? All meetings that conform to the time blocks will be scheduled first. After initial scheduling, meetings that do not conform to the time blocks will be scheduled on a space-available basis. Does the 12% apply to classes occurring at 2:30pm or later? Yes, the 2:30pm cut-off applies only to block scheduling. The 12% distribution will apply to all times during the instructional day (8:30am-6:20pm). How are you calculating the distribution limits? Only instruction occurring in general-assignment space will be considered. All instructional hours begin 30 minutes after the hour (eg, 8:30am, 9:30am, 10:30am, etc.) The 10-minute pass time after each meeting will be counted as instructional time for the preceding meeting. If a meeting begins or ends on the hour, only that partial hour will be counted as instructional time. All instruction occurring on Saturdays or after 6:30pm on weekdays will be considered outside of the instructional day, but will count toward the total instructional time. For curricular joints (ie, joints that are listed in the course catalog), only the responsible scheduling unit will be assessed the instructional time. For ad hoc joints (aka, ‘withers’ — that is, joints that are not listed in the course catalog), each scheduling unit will be assessed the instructional time against their total instructional time. If a scheduling unit has multiple sections in a ‘wither’ joint loop, the class will only count once against the total instructional time. Once total instructional time is calculated, the 10%/12% weekly limit at any given instructional hour will be calculated. The resulting number will be rounded up to the nearest whole number. What if my department is really small? How do we evenly spread our classes? For distribution determination (ie, for determining the 12% instructional limit), all scheduling units will be considered to have a minimum of 50 instructional hours per week. What about sections in our own space? Sections scheduled in non-general-assignment spaces will not be considered as part of the distribution requirement. You are not restricted in duration (ie, you do not have to follow the scheduling blocks) or distribution of those sections. The central room-management offices (OUR and CTE) have limited pre-assignment agreements with certain units due to equipment constraints requiring certain sections to be scheduled into certain rooms. Those sections will continue to be pre-assigned, but they will also count toward the total instructional time. Where can we go for more help? For more help or questions about the policy, please email Learning-Spaces-Help@uw.edu.